Accessible only by boat, just minutes from Los Sueños Marina PLAYA FANTASIA is the most beautiful secluded beach and snorkel location in Costa Rica. You will have the opportunity to experience a pristine tropical dry forest, coral reef formations, and a quiet white sand beach. 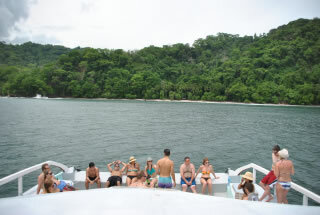 Aboard the comfortable 55' ft Catamaran, you will sail along the coastline to experience a completely different view of Costa Rica and the professional and friendly crew will make your experience a memorable one. Fresh fruits and refreshments will be provided throughout the cruise and a superb BBQ at Playa Fantasia is served in the forest overlooking the ocean. Explore more of this beautiful paradise, take a refreshing swim in the calm waters surrounding the reserve or simply relax and enjoy the tropical breeze. Rubber sandals, tennis or boat shoes.